[M. x loebneri], cv. (cultivated as such by several American institutions). = cv. Spring Snow. [M. x loebneri], cv. (J. C. McDaniel, University of Illinois) = cv. Spring Snow. [M. liliiflora], var. (de Candolle) Pampanini, Bull. Soc. Tosc. Ort.41: 140. (1916), leaves ovate, acuminate, glabrous; flowers large, pale, inodorous, campanulate, globose; tepals 9, ovate, fleshy, apex reflexed. basionym: M. inodora (de Candolle, Reg. Veg. Syst. 1: 459. 1817). [M. campbellii, M. sargentiana (? ), M. x soulangeana], cv. (Magnolia 20(1) [Issue 37]: 17, 1984). ‘Similar in size to ‘Mark Jury', but paler in color.’ Registered by Felix M. Jury, Waitare, New Zealand. (M. X. soulangeana cv. Lennei x M. x cv. Mark Jury (M. campbellii ssp. mollicomata x M. sargentiana var. robusta)). [M. x veitchii], cv. (Robert Veitch & Son, Exminster Nurseries, near Exeter, England, before 1950), in Roy. Hort. 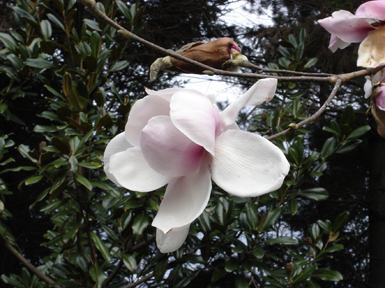 Soc., Camellias & Magnolias Conf. Report, p. 102, FIG, 33 (1950), ‘has flowers of approximately the same size as M. veitchii but they are whiter.’ it was named after the town of Isca in Exeter. 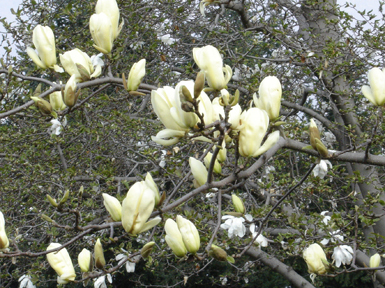 Treseder’s Nurseries Catalog, p. 8, circa 1965, Truro, Cornwall, England, ‘bears satiny-white flowers along horizontal branches opening about a week earlier than the cv. Veitchii Clone. [M. x veitchii], cv. 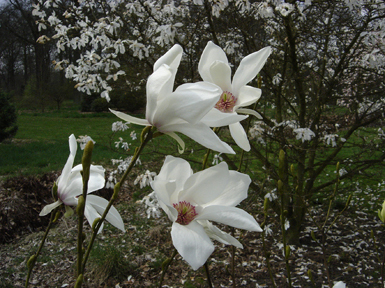 (sic) Kruessmann, Index Tremoniensis p. 76 (1970), Dortmund Botanic Garden, Germany) = cv. Isca. [M. kobus, M. salicifolia], cv. (Magnolia 22(2) [Issue 42]: 11, 1986-7). 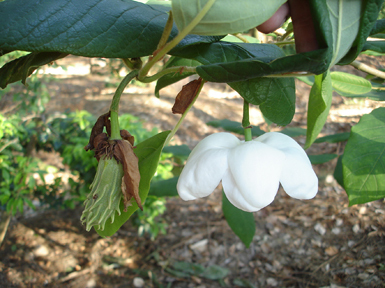 ‘Small, Christmas tree-shaped plant, covered with large white flowers with stamens tipped red. 15-20 feet tall after 30 years.’ Introduced by Iufer Nursery, Salem, Oregon. Magnolia 21(2) [Issue 40]: 14, 1986. (M. salicifolia x M. kobus). [M. salicifolia], cv. (Otto Eisenhut nursery catalog, p. 5, 1989, Ticino, Switzerland). ‘Large and profuse flowers.’ = M. kobus x M. salicifolia cv. Iufer? [M. acuminata, M. denudata], cv. (Magnolia 22(2) [Issue 42]: 11, 1986-7). 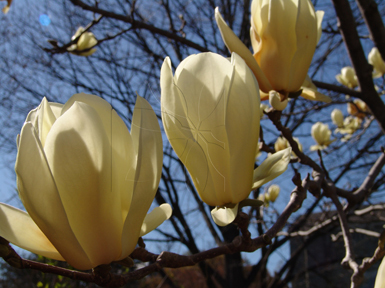 ‘Blooms before leaf emergence. Nine tepals: interior R.H.S. yellow 8D, exterior yellow-green 145A on exterior midribs of outer tepals; gynoecium yellow-green 150B; anthers yellow 8C tipped with narrow stripes of red-purple 62B. Corolla 16 CM. wide by 9.5 CM. long. Hardy to at least -22 F.’ Registered by David Leach, 1894 Hubbard Road, Madison, Ohio, 44057. [M. sargentiana, M. sprengeri], cv. (Magnolia 33(1) [Issue 63]: 29, 1998). ‘This cross was made by Philip Tregunna (head gardener at Caerhays from 1956 to 1996). 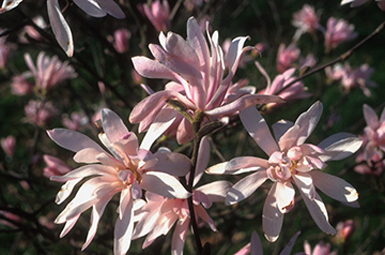 The seed parent is a first-generation seedling from original sargentiana ‘Robusta’ plants sent to Caerhays from the Arnold Arboretum. 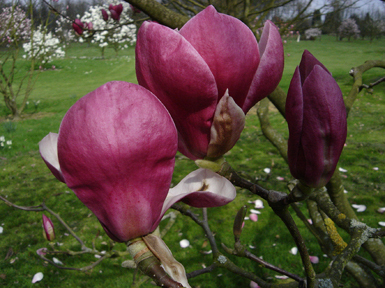 The pollen parent was a ‘Diva’ seedling growing at Caerhays. ‘J.C. Williams’ is similar to M. campbellii var. mollicomata ‘Lanarth,’ but is subtly different in flower color when the two trees are compared. It is named after J.C. Williams (1861–1939) who founded and built the modern garden at Caerhays, purchased the original ‘Diva’ seedling at Caerhays, and was one of the first to flower M. sargentiana ‘Robusta’ in the U.K. Registered in June, 1997 by F.J. Williams.’ = M. sargentiana cv Robusta x M. sprengeri cv Diva seedling. [M. liliiflora, M. stellata], cv. (Dudley & Kosar, Morris Arb. Bull. 19: 27, fig. 3. 1968), late blooming, flowers small, 3-4 in. in diameter, buds erect, slender, red-purple (RHS 71A-74D), tepals 8-10, obovate-spatulate, 2-2 1/2 in. long, 1/2-1 in. wide, obtuse, involute, purple (RHS 78B) grading to red-purple (RHS 73A-74D) or purple (75C-75D), inside white (RHS 155D), stamens 90-110, red-purple (RHS 59B-59C-71B). A sterile triploid. U.S. Natl. Arb. #28349. (M. liliiflora cv. Reflorescens x M. Stellata cv. Waterlily). [M. denudata], cv. (Treseder’s Nurseries Catalog, p. 3, circa 1965, Truro, Cornwall, England) as cv. Japanese Clone. ‘A selected form of this...species.’ synonym: cv. Wada's Form. [M. x soulangeana, M. x veitchii(? )], cv. (Magnolia 20(1) [Issue 37]: 17, 1984). ‘The darkest purple flower of all the Gresham hybrids. The tulip shaped, deep purple buds open up as well formed, bowl shaped flowers.’ Registered by Ken Durio, Opelousas, Louisiana. Syn. : JMcD#6, LA#77, G66-3. [M. x soulangeana, M. x veitchii], cv. (Otto Eisenhut Nursery Catalog, p. 2, 1989, Ticino, Switzerland). ‘Very fine, huge pink.’ Syn. : cv Mary Nell, JMcD#2, LA#87, G66-1358. [M. cylindrica ?] cv. 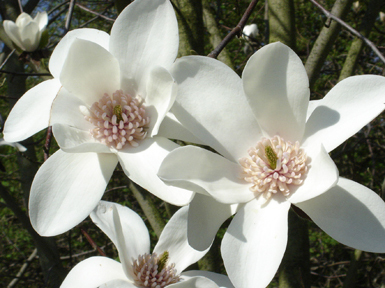 (Magnolia 36(2) [Issue 70]: 18, 2001) This tree, originating at Savill, produces pure white cup-and-saucer shaped flowers that are 22.9cm (9in) across; named and registered (May 2001) by Timothy Whiteley. [M. x soulangeana, M. x veitchii(? )], cv. (Otto Eisenhut Nursery Catalog, p. 2, 1989, Ticino, Switzerland). ‘JG 3.’ Nomen nudum. (Callaway, Dorothy J. The World of Magnolias, p. 219, 1994). 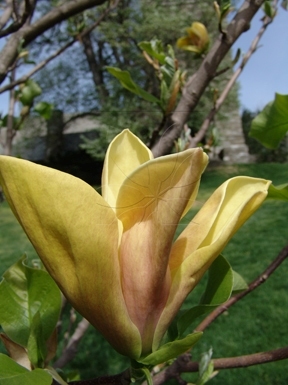 ‘A late flowering Gresham Hybrid which flowers profusely. Tepals deep reddish purple at base, becoming lighter toward the tip. Tepals 5.5 to 6 in. (14.0 to 15.2 cm) long. 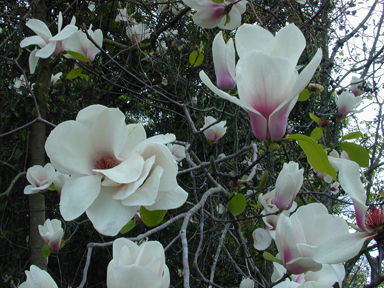 Selected and named by John Allen Smith, Magnolia Nursery, Chunchula, Alabama, from hybrids of Todd Gresham planted at Gloster Arboretum, Gloster, Mississippi.’ Syn: JG#3. [M. liliiflora, M. stellata], cv. (Dudley & Kosar, Morris Arb. Bull. 19: 28. 1968), midseason blooming, flowers small, 2-3 in. 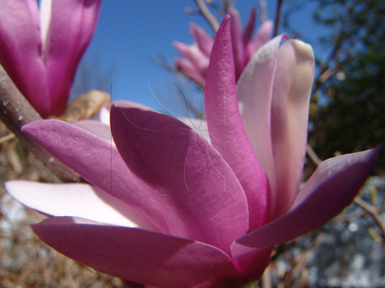 in diameter, buds erect, red-purple (RHS 71A-70A), tepals keeled and flaring, red-purple (RHS 7OB-70D), inside creamy-white (RHS 155A); stamens 40-50, red-purple (RHS 71A). A sterile triploid. U.S. Natl. Arb. #28345. (M. liliiflora cv. Nigra x M. stellata). [M. macrophylla], cv. (Magnolia 20(1) [Issue 37]: 17, 1984). 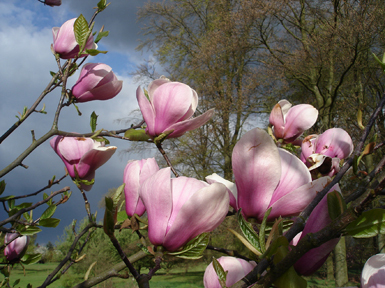 ‘A highly fertile specimen, fully hardy to Zone 6. 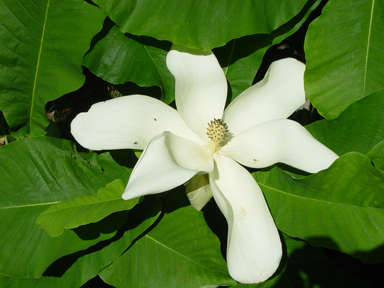 Leaves and flowers typical of the species.’ (Polly Hill, Vineyard Haven, Massachusetts in Magnolia 18(2): 13-14, 1982).